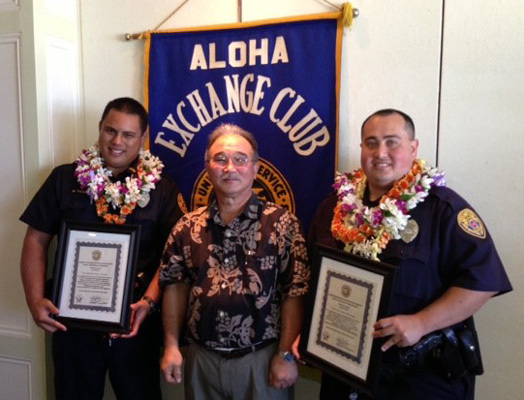 The Aloha Exchange Club of East Hawaiʻi recognized Officers Murray Toledo and Luke Watkins on Thursday (February 28) as the East Hawaiʻi “Officers of the Month” for February. The two officers, who are assigned to the Puna District, were honored for rescuing foreign visitors who got lost during a hike near the lava viewing area in Kalapana on January 8. The Chinese-speaking couple reported at 6:30 p.m. that they had been lost for about four hours and were nearly out of food and water. After midnight, the lost hikers still had not been located. They were communicating by cellular phone and the coverage was spotty. Watkins and Toledo were concerned for their safety. They could see the hiker’s flashlights waving in the distance, so they devised a plan for Watkins to act as a spotter from high ground and guided Toledo to the hikers’ position. It was 3:15 a.m. by the time Toledo and the hikers walked out and made contact with Fire Department personnel, who took the couple to Hilo Medical Center. The officers also arranged for the couple’s rental car to be towed to a safe location and contacted the Visitor Aloha Society of Hawaiʻi to provide them with additional assistance. Acting Captain Reed Mahuna noted in nomination papers that the 66-year-old female hiker credited Officer Toledo with saving their lives.